If you’ve been following my blog, you know that I don’t have a huge amount of space for my craft supplies, but I still have a fabulous craft storage system that I use to make beautiful crafts. It’s all about making the most out of the space that you do have! Today we’re going to tackle the larger part of craft organization like shelving and furniture. We’ll focus on the nitty gritty aspect of organizing and labeling individual supplies in the next post in the series. It’s helpful to choose the larger system first so that you don’t end up with a bunch of containers or boxes that don’t work with your storage system! Figure out where you’re going to store your craft stash. If you have a closet, part of a room, or even an entire room, then that’s perfect! Even if you don’t have a huge amount of space, if you’ve got an empty wall or corner that’s free, that’s a great spot for storing some craft supplies. 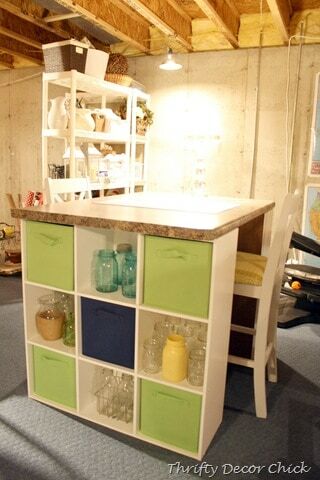 Look for hidden storage areas in your house that you could use. 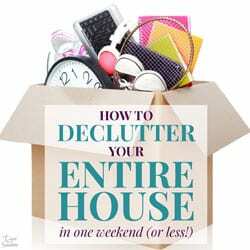 You might even find some extra space by rearranging existing furniture. 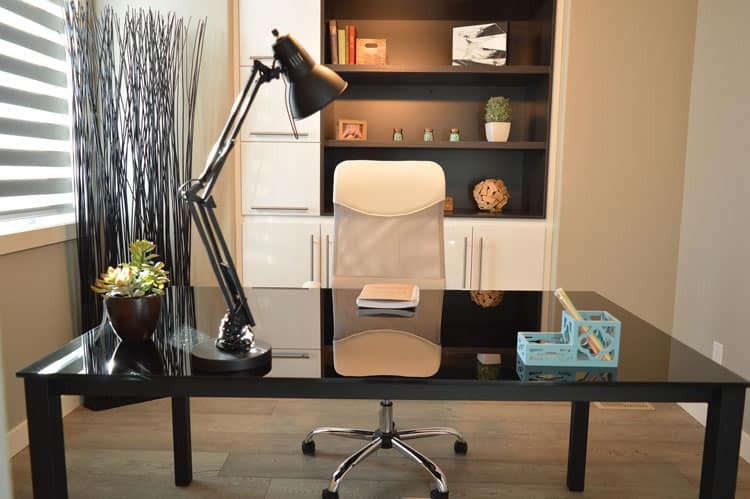 If you feel like you have absolutely nowhere to store your craft supplies, you might want to apply my decluttering tips to another area of your house to make room. Getting rid of outgrown and worn out clothes, old toys and books, unused kitchen appliances, and extra holiday decorations can give you so much more room for things you actually do use. It’s amazing what kind of space you can find when you get rid of a few things you no longer need! Plan out how you want to organize your craft space. 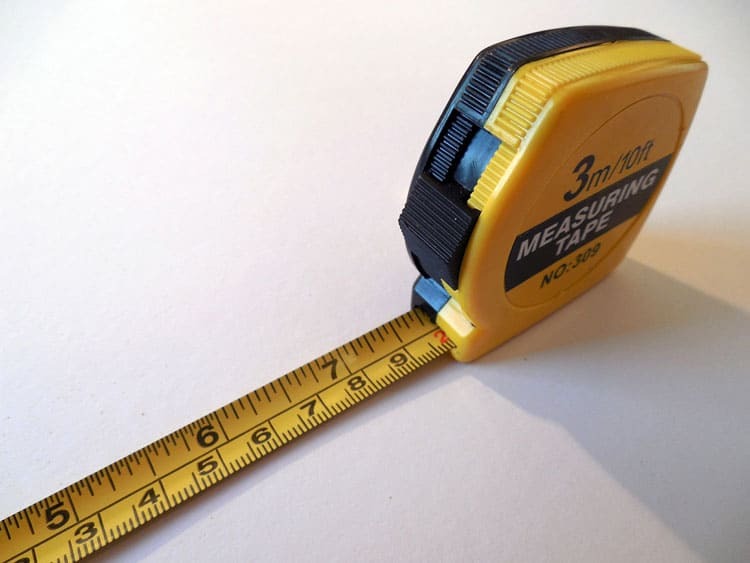 Measure (for real, like with a measuring tape!) your space and plot out what you want to do with it. You might use a pen and paper or an online room planning app to help you… whatever works best for you! Use the ideas below for inspiration for creating and customizing your own craft space with the perfect craft supply organizer! Keep your craft supplies in mind when you’re choosing your craft storage. 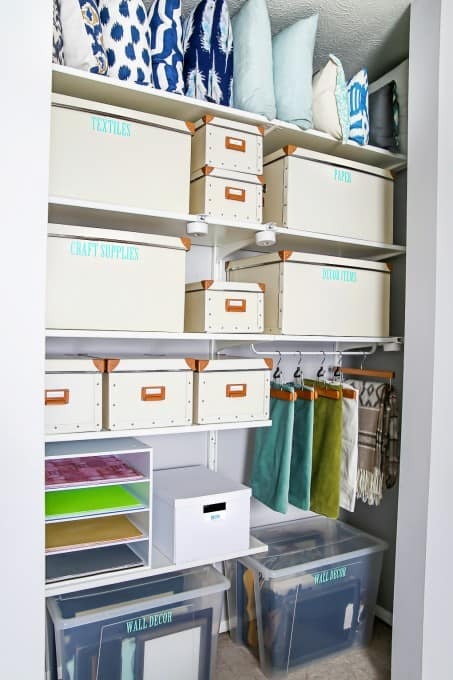 If you have a lot of a certain supply such as fabric, paint, paper, etc., envision how you will store those supplies on the shelves of your organizer ahead of time. Use what you already have! Do you have a piece of furniture that’s not getting much use? 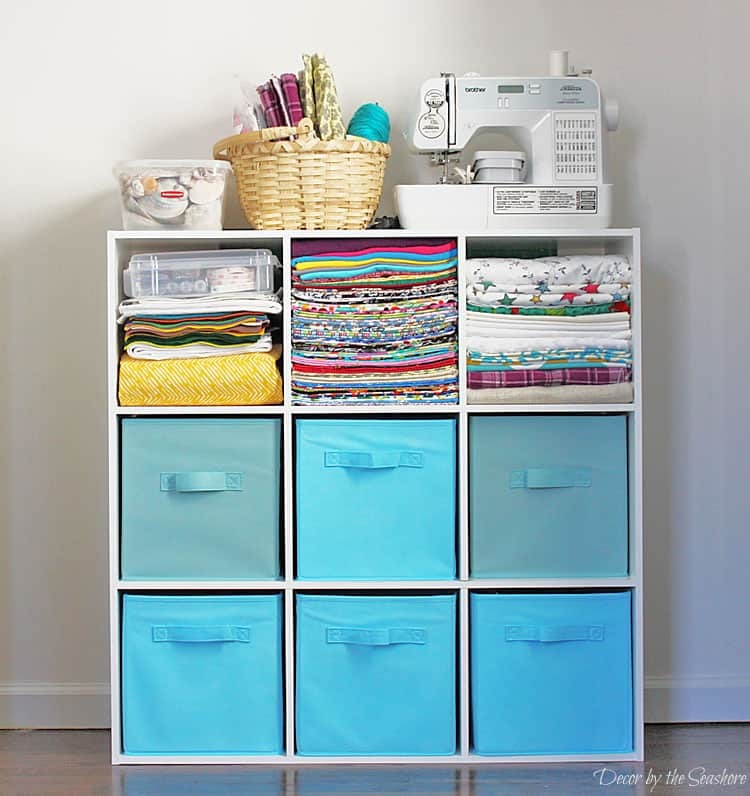 Repurpose it as a craft supply organizer to store your craft stash! Dressers, desks, bookshelves, etc. make great craft supply storage. Also check out local yard sales or Craigslist. People sometimes get rid of unwanted furniture for a steal. Often times, it just needs a fresh coat of paint to look good as new, like this gorgeous vintage dresser from Heidi at Happiness is Homemade! 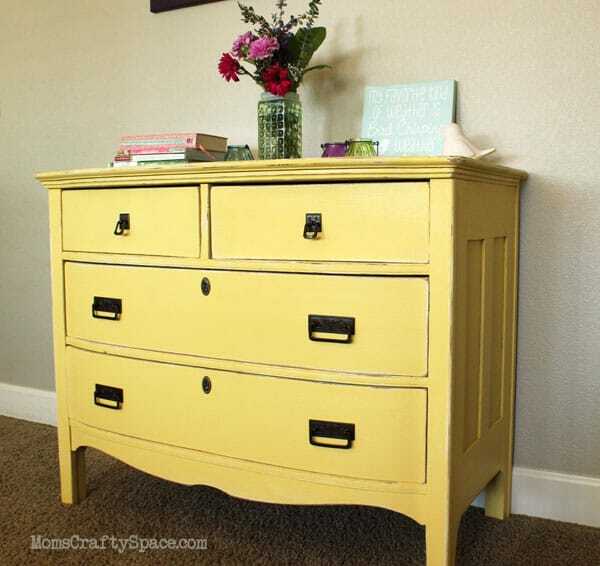 Can you believe she got this dresser for $25? Bookshelves are great for craft storage. You can store craft supplies directly on the shelves or put them in small baskets and containers to display. There’s such a large variety of bookshelves available that you can pretty much find one in whatever size you’re looking for. If you have decent space, you can even combine several bookshelves together for a cohesive look with even more storage! Jaime from Raising Up Rubies created a large craft shelf by combining several old cheap bookshelves and adding some crown molding and paint! How creative is that? I particularly like the cubeicals you can find at many stores today. I use this 9 cube organizer as a craft supply organizer, which you can read about here. It fits in my closet and holds all of my craft supplies perfectly. You can get drawers that are sized just right for the cubes, so they stay nice and organized, and you can easily find your supplies. There are a variety of different sizes available (3, 6, 8, 9, and 12 cubes), so you can customize the cube to fit your space. I have my organizer stored in a closet, but it looks nice enough that you could have it displayed in a room of your home. Closets make great storage for craft supplies, and there are so many different kinds of customizable shelving options available for them. (It is beyond me why every closet is always designed with a little shelf and one long rod. How inefficient is that?!) Use an online closet planning tool like this one to help you plot it all out. You can design your closet to fit your specific measurements and craft storage needs, like Abby from Just a Girl and her Blog did with her closet system from Ikea. I know a lot of crafters use large storage bins to store their craft supplies. I used these large bins for a long time. I personally prefer open shelving over bins, because they’re easier to keep organized, but if you just have a small amount of space such as under a bed, then bins are a great solution. I suggest using clear bins so that you can easily see what’s in the bin and eliminate rooting around when looking for supplies. Carts with wheels are a great way to store craft supplies. You can move them around to whatever location suits your storage space, and they hold a good amount of supplies. There’s a large variety of carts made from all kinds of materials and fun colors. Some carts have drawers, so it’s easy to store craft supplies. 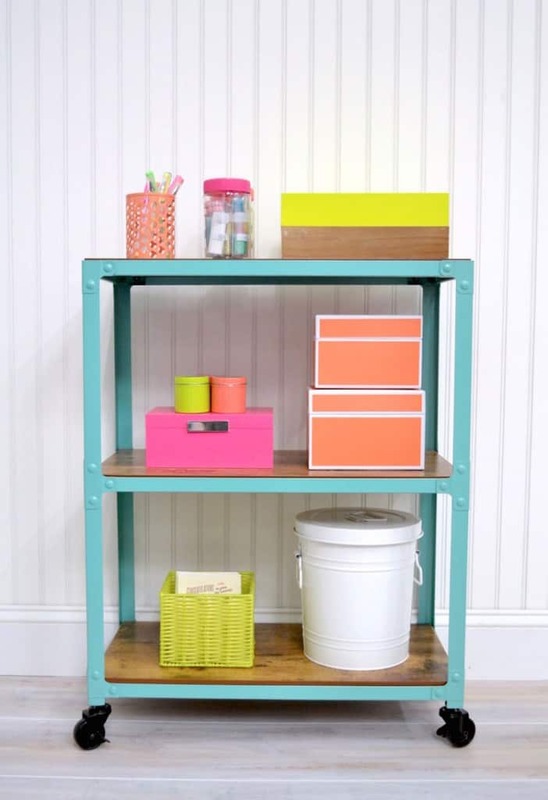 Other carts you can use baskets and bins, like this one from Amy at Mod Podge Rocks. The back of a door is a great storage area that is often forgotten about. Over-the-door storage is a great space saver and perfect for storing smaller odds and ends, especially in closets where you’ll never see them. You can use a shoe organizer like Sara from Mom Endeavors (she also uses the storage cubes that I love so much), or something a little more robust such as a door rack with small shelves like Katie from View from the Fridge. Just shut the door and nobody even knows it’s there. Too easy! Don’t forget about the walls! Stand-alone wall shelves make great craft storage, and if you’re handy with tools, they’re fairly easy to make and hang yourself. Amy from 11 Magnolia Lane has a great tutorial for making your own shelves. 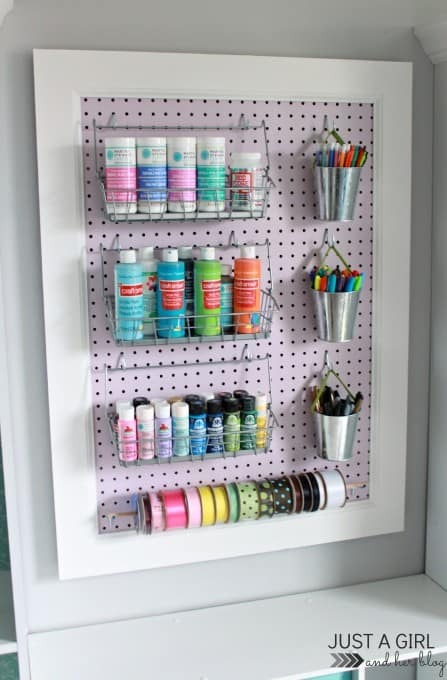 Pegboards are also pretty popular for hanging tools and odds and ends. 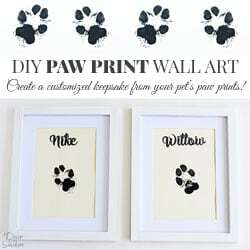 You can fancy them up by framing and painting them like Abby from Just a Girl and her Blog did with her pegboard. If you have your own craft room or extra space, plan out a table or work space where you can craft. Sometimes you can even sneak some storage into your craft table like Sarah from Thrifty Decor Chick. She attached an old counter top to two cubeicals (though you could easily also use a piece of wood). Those cubes are so handy! Before buying any furniture or shelving for your craft supplies, make sure to measure your space so that you know it will actually fit before you buy it! 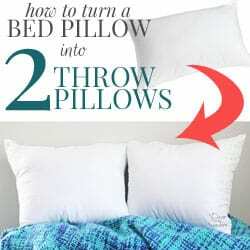 This will save you so much time and spare you the hassle of buying or making something only to find it’s the wrong size for your space. And don’t forget to have fun and get creative! When designing your craft space and choosing a craft supply organizer, creativity is the name of the game. Gather your craft storage ideas and inspiration, and then make them uniquely yours. The options are really endless! 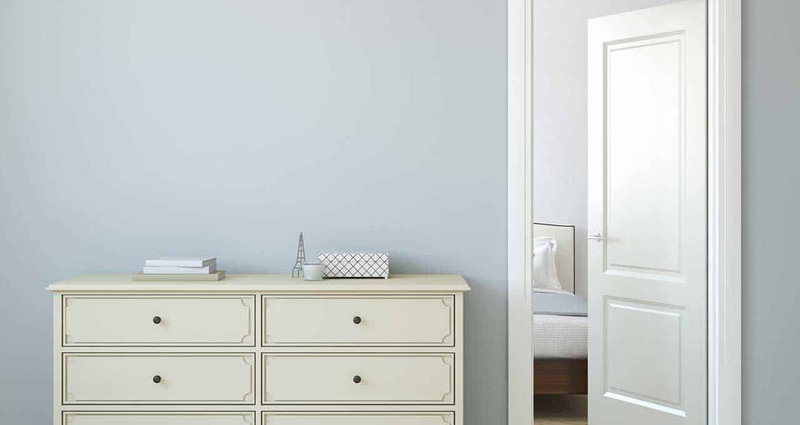 If you find a storage system that would work for your space but you don’t like the look of it, remember that you can always paint it and enhance it to make it look beautiful and perfect for your space! If you’d like to browse through more creative craft room ideas, check out my Pinterest board craft rooms and storage! It’s a wealth of craft organization ideas! 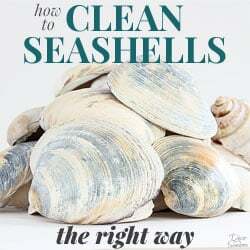 Follow Celeste @ Decor by the Seashore’s board Craft Rooms & Storage on Pinterest. If you have any questions about choosing a craft supply organizer and organizing your own craft space, feel free to leave a comment below or email me. I promise I don’t bite, and I’ll try to give you some personalized pointers to help you figure out a system and arrange your craft supplies! In the third part of the series, I show you how to organize and arrange your craft supplies in your craft area so that you can always find what you’re looking for and get that beautiful look you always see in magazines and on Pinterest! 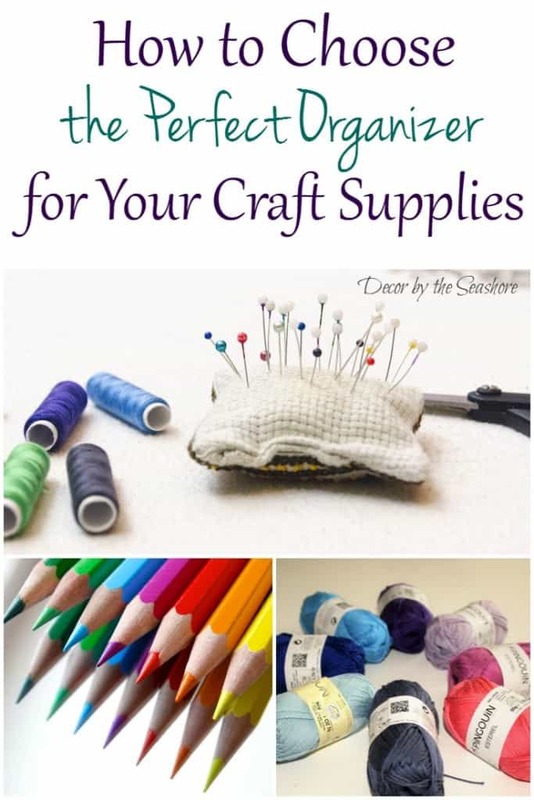 And in case you’ve missed part 1, I’ve included the link below so that you can get to work decluttering your craft stash. Check it out! Part 1: How to Declutter Your Craft Supplies and Make Room for the Good Stuff! Part 3: How to Organize Your Craft Supplies and Make Your Craft Stash a Show-Stopper! 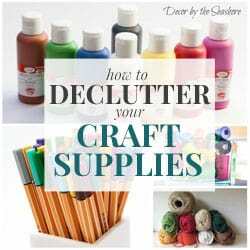 « How to Declutter Your Craft Supplies and Make Room for the Good Stuff! Wow, what a lot of great advice and ideas. And organizing craft stuff is so important because it takes twice as long to do any project if you have to search for all the supplies. I’m pinning so I can remember to use a few of these ideas. Thanks, Rebecca! It really does take so much longer to complete a craft when you have to find all of your supplies! This should help get those craft supplies under control! 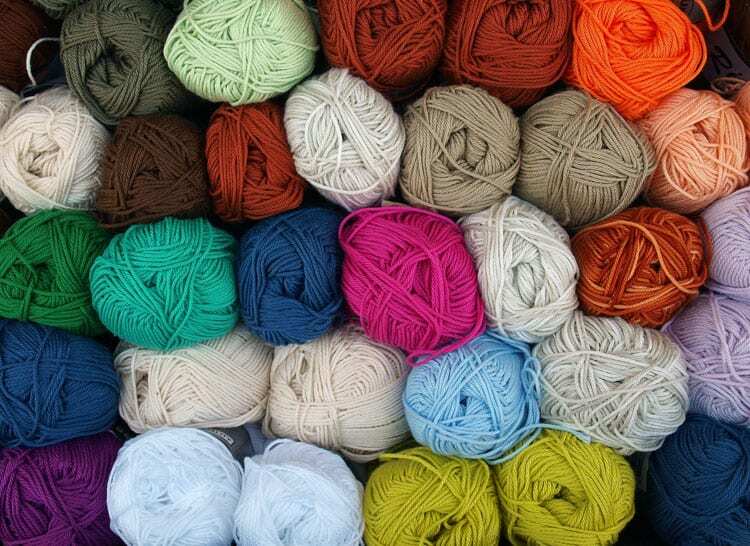 Good luck sorting through your craft stash! These are all excellent ideas. I love the little storage units. I have one now but it’s full of paperwork, maybe I can move the papers and use it just for my supplies! Thanks for the inspiration! Great idea, Mary! That would be perfect for storing your craft stash! Those little storage units are great for craft supplies. So glad I could help you find some inspiration around your home! Love all of the ideas, trying to get my craft room in order. I find fabric the hardest to keep neat! Susan, it can be hard to keep fabric neat, especially if you have a lot of it! I find that if I make an effort to always put it back the right way after I’m finished with it, it’s easier to keep organized and looking nice! I’ll take all these! They’re all so inviting in their own way! Aren’t they though? It’s hard to choose just one or two! Wow, I was a little overwhelmed by all these great ideas. After reviewing our area, it makes a lot of sense to make an area that is dedicated to just holding the craft supplies. Especially true with all the specialty paper that we used, needs to be organized by various uses. Thank you for getting us on the right track. 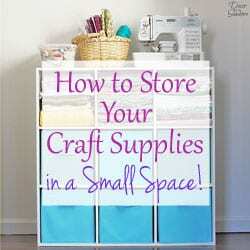 Glad to hear I was able to give you some ideas for storing all those craft supplies! 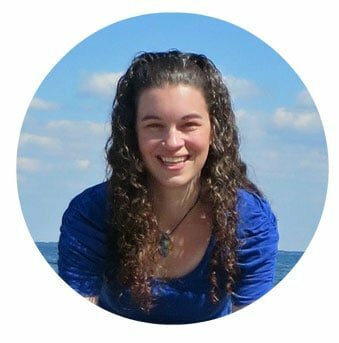 Thank you Celeste, I’m in the process of planning my craft room and these articles helped so much. I am using what I have in the furniture and storage department, will replace as I can afford to. I’ll be watching for your future posts I am so looking forward to step three and being able to actually craft. I sew home decor( valances,drapes,bedspreads shams,pillows, etc) therefore I have large rolls of decorating fabric, pillow forms . Have an idea to store ? I actually have a whole room with double closet one complete wall of dressers, corner unit and corner book shelf. I use this to watch tv. Two wing back chairs and sewing machine I know with all this space it still looks cluttered help!